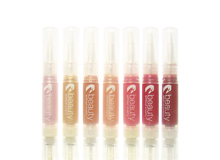 long lasting lip gloss contains over 45% natural Jojoba Oil. This special oil is extremely close to the skins own natural sebum wax and therefore assists the skin with natural moisturising processes. All shades are adaptable and can be worn lightly for slight gloss or applied fully for a stronger effect.